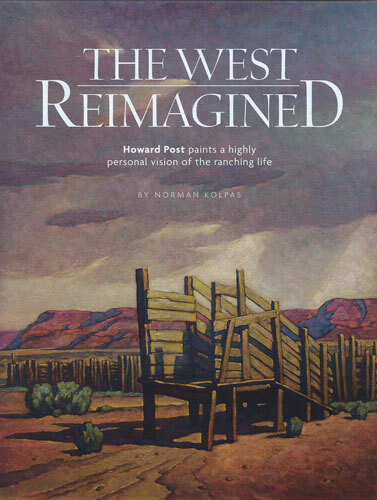 Howard Post paints a highly personalized vision of the ranching life. 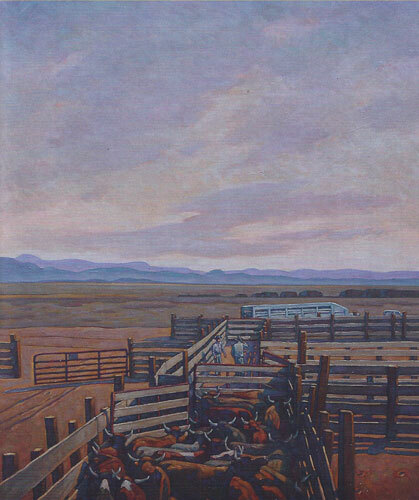 Howard Post, Distant Storm, oil, 40"x30"
Horses huddle together on the arid Arizona range, their coats vibrant in an assortment of oranges, violets, and browns. On a remote ranch in Utah, an old wooden loading chute seems bowed beneath the weight of storm clouds looming so powerfully overhead that they threaten to engulf the viewer. In a pen made of weathered boards, a trio of native cattle blend into shadows. These three paintings, Strawberry Roan, Distant Storm, and The Three Natives, all undeniably capture the spirit of the American West. Yet none of them hew to the subject matter, composition, or colors that have traditionally defined western art. There are no images of cowboys atop bucking broncs or bulls, no vast expanses of idealized landscape that seem to lack only a posse chase or an Indian buffalo hunt to bring them to full Cinemascope life. It's tempting, and possibly valid, to chalk up such disclaimers to the natural modesty that comes from the kind of hardworking ranching life to which Post was born back in 1948, the youngest of Gertrude and Kevin “Bum” Post’s four children. He was raised on his parents’ 30-acre ranch outside of Tucson, AZ, where they kept small herds of horses and cattle they supplied to rodeo competitions. “I grew up wanting to be a cowboy like my dad,” he says. So, naturally, he gravitated to rodeo from the get-go. He first competed in junior events as a 12-year-old and went on to win the Arizona High School All-Around Championship in his senior year. 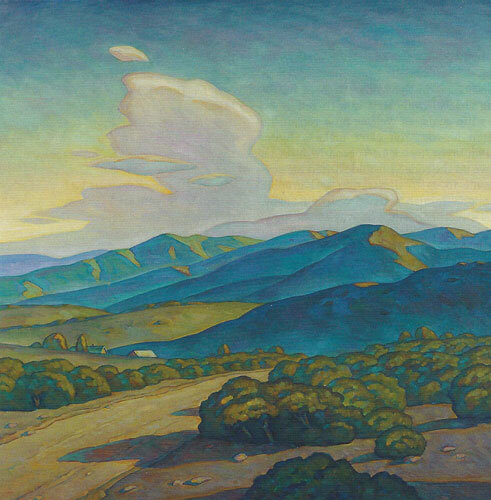 Howard Post, End of the Road, oil, 36"x36"
In 1967 and '68, Post took a two-year leave from school to serve as a Mormon missionary in the Midwest. That fulfilling time also allowed him to reflect on his life goals, as well as on a refrain he often heard: “You can’t make a living as an artist.” Back in Tucson in 1970, he gave up the rodeo life and shifted his academic focus to illustration and graphic design. He also married Marilyn Busby, his sweetheart since he was 15 and now, 44 years later, his beloved wife, mother to their five grown children, and a grandma 18 times over. After Post graduated in 1972, he, Marilyn, and their first child moved to Salt Lake City, where he'd accepted a job as a designer and illustrator with LDS Publications. During his three years there, he honed his skills on a range of magazine and book projects. Then, in 1975, a call came from one of his former professors at the university to fill in for a faculty member taking a two-year sabbatical. Post jumped at the chance, as well as the opportunity it offered him simultaneously to earn a master`s degree. “That's where I really got to focus on finding my own style,”he says. At the time. Post had been painting cowboys “like a zillion other guys, he says, citing the inspiration he drew from his “heroes,” all members of the Cowboy Artists of America. But a key moment arrived with the advice of one of his professor friends. “He told me, ‘I want you to throw out all that stuff, go out to your dad’s ranch, and paint things you have firsthand experience with, the corrals and the steers and horses.’ I realized that was my thing” - by which he means an intimate, behind-the-scenes viewpoint of the ranching and rodeo life. Howard Post, Moving to New Pastures, oil, 52"x42"
The resulting dozen or so large-scale canvases became Post’s thesis show. Attending it was Elaine Horwitch, who owned galleries in Scottsdale and Santa Fe that helped define contemporary western art in the years before her 1991 passing. She invited Post to join her stable of artists. When Post received his master’s degree and stopped teaching in 1978, he launched into self-employment, with a home studio that was “set up at one end of the room with my illustration board and at the other end with my easel. If I wasn't at work on assigned illustrations,” he says, "I'd be painting.” Gradually, his signature style evolved. 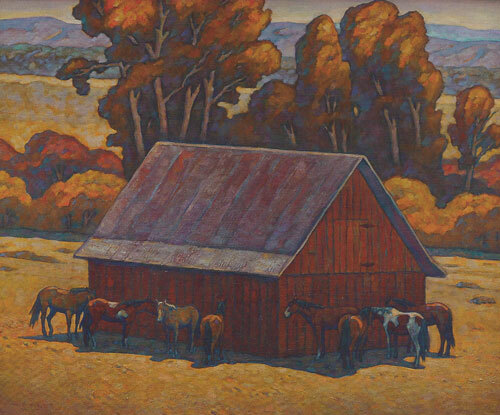 Howard Post, Eight in the Shade, oil, 36"x44"
Medicine Man Gallery, Tucson, AZ; Altamira Fine Art, Jackson, WY; Sally Hendrickson Fine Art, Denver, CO.
Norman Kolpas is a Los Angeles-based freelancer who writes for Mountain Living and Colorado Homes &Lifestyles as well as SouthwestArt.